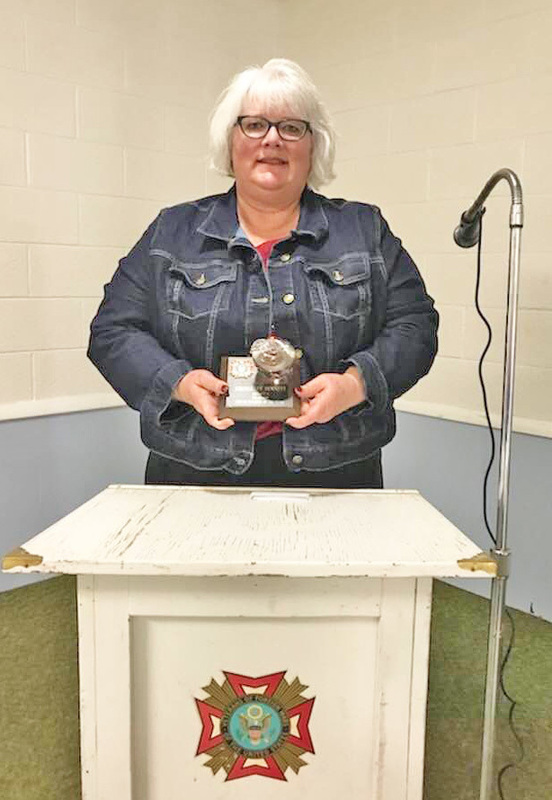 Holyoke School District would like to recognize 3-4 Grade Social Studies teacher Ms. Kimberlee Bennett as winner of the Colorado 2018 VFW Teacher of the Year in the Elementary Category. After winning teacher of the year at the local and district levels, Ms. Bennett was selected for the top honor at the state level where she was in competition with many other talented and dedicated educators in Colorado. We are proud of Kimberlee Bennett and grateful for her dedicated career as a teacher in Holyoke. Kimberlee was nominated by co-worker Lynn Schneider who has shared a copy of the nomination letter below. I would like to nominate Kimberlee Bennett, Holyoke Elementary third/ fourth grade social studies teacher, as this year’s recipient of the National Citizenship Education Teachers’ Award. Mrs. Bennett works tirelessly to provide students with a thorough, well-rounded education emphasizing civics and citizenship, while constantly striving to make her lessons relevant and engaging. In third grade, Mrs. Bennett’s students focus on local community. Many “homework” assignments involve students learning about Holyoke through activities such as finding out who serves on the school board or what businesses are on main street. Speakers brought in from the community and outside field trips allow students to experience and explore unfamiliar parts of Holyoke. Another focus involves learning the history of the community, where students create a time line of Holyoke’s past. Concerning local government, she ensures students know who their elected officials are and what roles they play. Woven throughout, is a constant dialogue of what it means to be a good citizen of the community and the role students play in making it strong and helping it thrive. In fourth grade, third grade foundations are extended to the state and national levels. Citizenship is a major focus as students explore their roles as voters and constituents. She utilizes creative approaches to help students develop an understanding of the history and geography of Colorado including inviting the National Geographic giant travelling map into our school, then having students research and share information about its regions. Another exciting activity is having students utilize their Chromebooks to create videos of places they visit which are then shared with the class. The year’s culmination is an entrepreneur unit in which students learn first-hand what it means to be a responsible member of the economy. Students work in small groups to create a business, manufacture a product, market and advertise, and then sell their product, bringing the basics of economics to life. Mrs. Bennett’s dedication to helping students weave social studies concepts into all aspects of their lives is to be commended, and I highly recommend her as an outstanding recipient of your award.